I thought it would be nice to share a few foods you can eat during a diet, or you can eat all of these foods everyday , they’re really great and healthy to achieving a flat stomach. just in time for the summer/ bikin season. 1. Strawberries : are packed with fiber wich keeps you felling full longer, they’re full of Vitamin C it is good for your Immune. 2. Oatmel: will keep you satiated, because ist full of fiber. Check out my overnight oats. 3. Low- fat yoghurt: has calcium, is also probiotic that fights, fast storage and prevents bloat. 5. Salmon: full of omeg 3 fatty acids, help to bumbp up your metabolism, your body is going to burn fat faster. 6. Watermelon: how the name say it, is full of water, helps to flush extra water from your system. 7. Avocado: has lots of healthy fats that burn fat while providing your body with energy. Did you make the picture? And if so, how? Thanks! hay. No I’ve don’t made them, I’ve only create the collage, every food is an own picture I’ve saved from google. 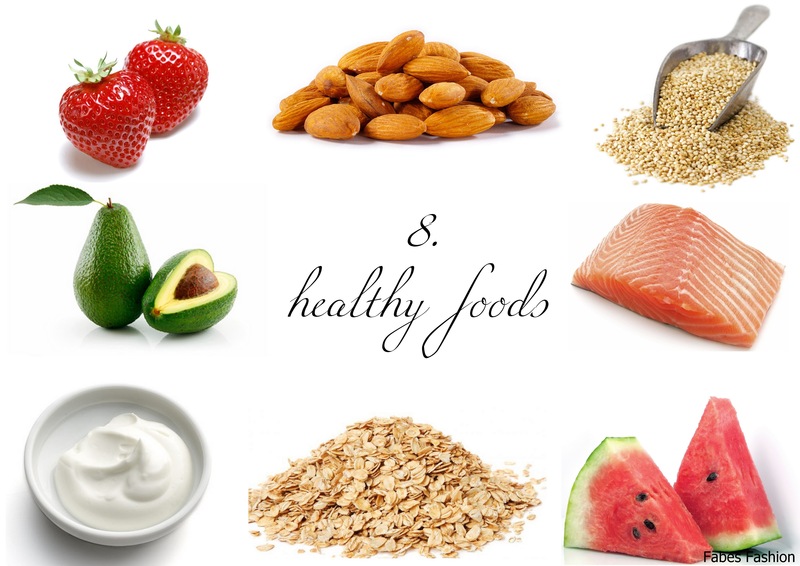 Love your list of healthy foods, they look much more appetiizing on your post. Off to buy some salmon.